Hunter Age: The New Journey is an awesome RPG strategy game from Plug’n’Play. Traverse through beautiful landscapes and go on invigorating adventures through an intriguing novel-based storyline. Tackle challenging missions and tons of enemies are awaiting for you. Control the characters to engage the battle in different style to pass 75 levels with increasing difficulty. 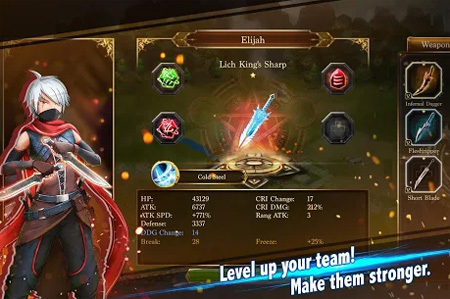 You can choose from 5 unique characters, each of them with unique skills and different abilities. Challenge the infinite battle in endless Tower. Play the game and get daily rewards including gold coins, soul stones and Legendary items. If you get stuck in the game, check out the video walkthrough and gameplay for the game. This entry was posted in Android Games, iOS Games, Mobile Games, Walkthrough and tagged Hunter Age: The New Journey Cheats, Hunter Age: The New Journey Game, Hunter Age: The New Journey Gameplay, Hunter Age: The New Journey Guide, Hunter Age: The New Journey Hints, Hunter Age: The New Journey Review, Hunter Age: The New Journey Solutions, Hunter Age: The New Journey Strategy, Hunter Age: The New Journey Tips, Hunter Age: The New Journey Walkthrough by Marvin. Bookmark the permalink.